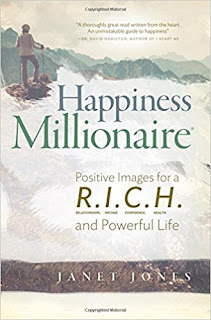 Get ready to be a Happiness Millionaire and change your life forever. Are you struggling to reach your potential, believing there is more to life but don’t know how to change it? Perhaps you are feeling unconfident, unfulfilled or even a little vulnerable? In short, I became a Happiness Millionaire, and now it’s your turn! Through my workshops, I’ve helped people just like you break through to a R.I.C.H. mindset and a fulfilling life. And now, the transformative power of the 13-positive images from the workshops are available to you in this book, to work through at your own pace. Take the journey they offer and move towards that worthy goal for which we are all striving: happiness. How very brave of Janet Jones to share her story with us and I can't begin to tell you how grateful I am that she did. It sounds easy but I think it is a difficult question to ask yourself - are you happy? If you have to think about the answer, then chances are you are not. I admit to being happy in some areas of my life but not so happy in others. I thought it was my lot in life and just took what I have been given but this wonderful book has taught me that I can take back control and change the direction of my life. As a born worrier, I recognised straight away that I am P.O.O.R., with a Poverty mindset and often feeling Overwhelmed, Off-balance and filled with Regret. I didn't even see anything wrong with this, thinking that it's just the way I am, until Janet started talking about 'desire'. It was like an epiphany for me as I realised that I'm floating along on the sea of life, letting the tidal currents take me where they will, and settling for 'good enough'. So what am I doing wrong? Listening to my pesky inner voice, that's what! How many times do you call yourself names that you think are harmless? You go shopping and forget your shopping list - what an idiot, or you drop your bookmark and lose your place in your book - you muppet! I didn't realise how often I did this and what makes it worse is that your brain can't distinguish between fact and fiction so it actually believes what you're telling it. This was another eureka moment for me and further confirmation that I was reading a truly inspirational book. The book contains 13 positive images that you are encouraged to look at for a certain length of time. Everyone will see something different in each image and afterwards we are given examples of other thoughts and interpretations. There is no wrong answer! For me, the images are there to inspire, provoke and enhance and I loved the 'in a nutshell' section at the end of each part so that we can be reminded of the images we have seen so far. 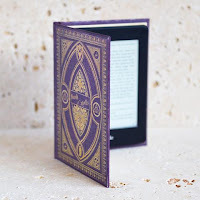 I do feel, however, that these images wouldn't transfer so well to kindle - seeing them in full colour and having the ability to flick back to them when required was an absolute necessity for me. 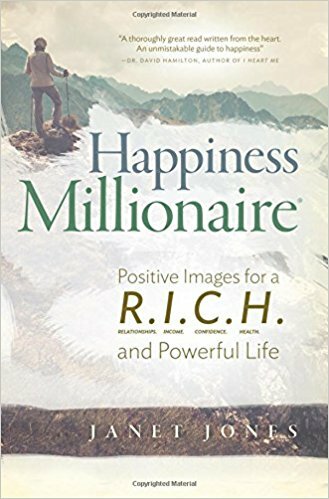 You're not going to be a Happiness Millionaire by the time you finish this book; like anything worthwhile, it's not going to happen overnight but you can start making deposits into the happiness bank today. I hadn't even reached the start of the inspirational images before I had changed my outlook and started to see immediate results. 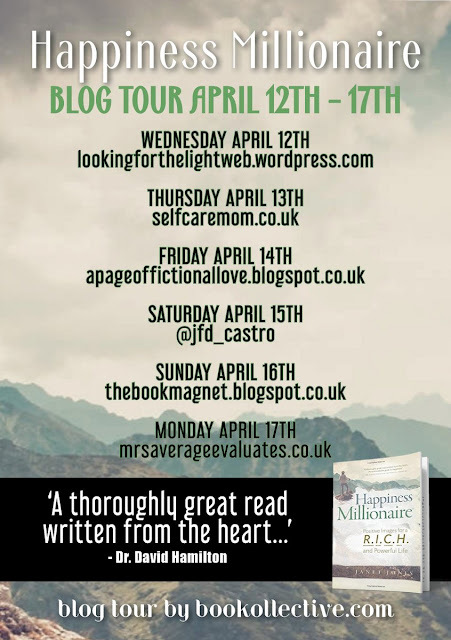 Truly inspirational and thought-provoking, Happiness Millionaire is a book to live, not just to read. Only by putting the ideas into practice will you start to see results and hopefully, like me, you will start to see results before you even finish the book.